If you want to be successful in the market, you need to ensure that your employees are top fit at all times. This explains why training programs are an integral part of ENGEL’s system philosophy. At the worldwide training centres, the injection moulding machine builder and automation expert offers seminars and workshops that are attended annually by more than 3000 participants. With its new online program, ENGEL is now extending its training portfolio and thus making ongoing training more efficient and easily accessible. A knowledge advantage is a competitive advantage. Despite this, participation in training events is often reduced to a few isolated dates in many companies. To give customers access to seminars and training sessions with very little time and cost overhead, ENGEL is taking a new approach in the dissemination of knowledge. ENGEL’s internet-based e learning platform is now available at any time and any place, whether just for a few minutes between tasks, or for a multiple-hour power training session. The content can be adjusted flexibly to meet individual requirements, and everyone can learn at their own speed. ENGEL e-learning first steps teaches basic skills and compact injection moulding know-how. The workings of an injection moulding machine and process control are intuitively explained, as are the various machine types and processing technologies. To test your own knowledge, even the basic module includes tests, which you can also take online. ENGEL e-learning standard seminars cover a wide range of topics, from EOB (ENGEL operator basics) to TPQ (Process and quality control), and the content is no different from the material taught at the ENGEL training centres. 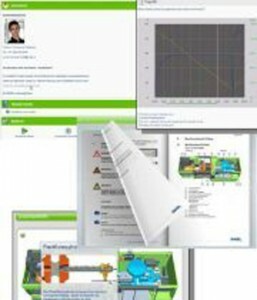 Online participants also have access to the original training manuals via the online platform. Our e-learning seminars are a particularly efficient alternative if you are unable to take place in a taught event for reasons of time or geography. At the same time, this program helps to refresh your acquired knowledge, and lets you take exams to acquire performance certificates. The final exam can be repeated any number of times, and you can follow your learning success in an intuitive test protocol. ENGEL e-learning competence assessment combines test questions from 19 plastics processing and robotics topics. It is useful as a regular performance check and supports a continual build-up of knowledge and skills. The test report can be used as the basis for needs-driven planning of training measures, and serve as an annual module in knowledge and skills management. The modules include videos and simulations for intuitive teaching of complex topics, and were compiled to reflect the latest educational methods. Companies can generate additional, enterprise-specific content for their staff, and configure the platform to match their corporate design. ENGEL e-learning is currently available in German and English. More languages are in preparation. ENGEL AUSTRIA started at a very early stage to deploy and develop modern knowledge dissemination methods to secure a competitive advantage for our customers. The milestones include the virt-mould simulation program which gives users the ability to install injection moulding machine control units on a PC for training and test purposes, live training via the internet (ENGEL e-trainer live) and, last but not least, the ENGEL e-learning platform.